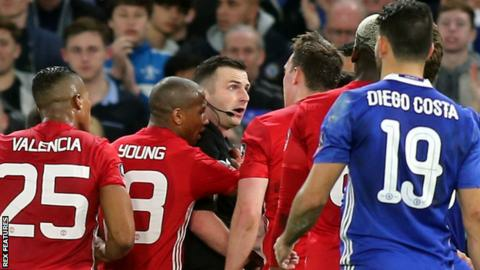 Manchester United have been fined £20,000 by the Football Association for failing to control their players in last Monday's FA Cup quarter-final defeat at Chelsea. United admitted a misconduct charge after referee Michael Oliver was surrounded by several players following the dismissal of midfielder Ander Herrera. United lost the tie 1-0. An FA statement said United had "accepted the standard penalty".